The worldwide prevalence of obesity more than doubled between 1980 and 2014.The fundamental cause of obesity and overweight is an energy imbalance between calories consumed and calories expended.Overweight and obesity are defined as abnormal or excessive fat accumulation that may impair health. 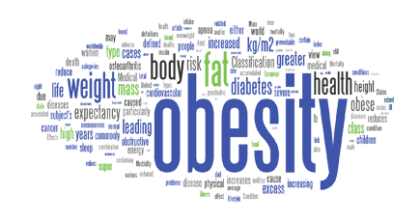 This year, the American Association of Clinical Endocrinologists and American College of Endocrinology clinical have published Practice Guidelines for Comprehensive Medical Care of patients with Obesity. What are the weight-related complications that are either caused or exacerbated by excess adiposity? Patients with overweight or obesity and patients experiencing progressive weight gain should be screened for pre diabetes and type 2 diabetes and evaluated for metabolic syndrome by assessing waist circumference, fasting glucose, A1C, blood pressure, and lipid panel, including triglycerides and HDL-c (Grade A;, upgraded due to high clinical relevance). • Patients with type 2 diabetes should be evaluated for the presence of overweight or obesity (Grade A; upgraded due to high relevance). • Blood pressure should be measured in all patients with overweight or obesity as a screen for the presence of hypertension or pre hypertension; all patients with hypertension should be evaluated for the presence of overweight or obesity (Grade A; upgraded due to high relevance). • Risk factors for cardiovascular disease should be assessed in patients with overweight or obesity (Grade A; upgraded due to high relevance). • Patients with overweight or obesity should be screened for active cardiovascular disease by history, physical examination, and with additional testing or expert referral based on cardiovascular disease risk status (Grade A; upgraded due to high relevance). • Screening for non-alcoholic fatty liver disease should be performed in all patients with overweight or obesity, type 2 diabetes, or metabolic syndrome with liver function testing, followed by ultrasound or other imaging modality if transaminases are elevated; all patients with non-alcoholic fatty liver disease should be evaluated for the presence of overweight or obesity (Grade B). • Pre menopausal female patients with overweight or obesity and/or metabolic syndrome should be screened for poly cystic ovary syndrome by history and physical examination; all patients with poly cystic ovary syndrome should be evaluated for the presence of overweight or obesity (Grade B). • Women with overweight or obesity should be counselled when appropriate that they are at increased risk for infertility and, if seeking assisted reproduction,should be informed of lower success rates of these procedures regarding conception and the ability to carry the pregnancy to live birth (Grade B). All female patients with infertility should be evaluated for the presence of overweight or obesity (Grade B). • All men who have an increased waist circumference or who have obesity should be assessed for hypogonadism by history and physical examination and be tested for testosterone deficiency if indicated; all male patients with hypogonadism should be evaluated for the presence of overweight or obesity (Grade B). • R20. All male patients with type 2 diabetes should be evaluated to exclude testosterone deficiency (Grade B). • All patients with overweight or obesity should be evaluated for obstructive sleep apnea during medical history and physical examination; this is based on the strong association of these disorders with each other (Grade B). Polysomnography and other sleep studies, at home or in a sleep lab, should be considered for patients at high risk for sleep apnea based on clinical presentation, severity of excess adiposity, and symptomatology (Grade D). All patients with obstructive sleep apnea should be evaluated for the presence of overweight or obesity (Grade B). • All patients with overweight or obesity should be evaluated for asthma and reactive airway disease based on the strong association of these disorders with each other (Grade B). Based on medical history, symptomatology, and physical examination, spirometry and other pulmonary function tests should be considered for patients at high risk for asthma and reactive airway disease (Grade D). All patients with asthma should be evaluated for the presence of overweight or obesity (Grade D). • All patients with overweight or obesity should be screened by symptom assessment and physical examination for osteoarthritis of the knee and other weight-bearing joints (Grade B; BEL 2). All patients with osteoarthritis should be evaluated for the presence of overweight or obesity (Grade D). •Patients with overweight or obesity or who have increased waist circumferences should be evaluated for symptoms of GERD (Grade B;); all patients with GERD should be evaluated for the presence of overweight or obesity (Grade C; ). • Patients with obesity and GERD symptoms should be evaluated by endoscopy if medical treatment fails to control symptoms (Grade B; ). • Endoscopy should be considered in patients with obesity and GERD symptoms prior to bariatric surgery (Grade B;. • Patients with overweight or obesity should be screened for depression; all patients with depression should be evaluated for the presence of overweight or obesity (Grade B; \).